In the spring of 2006, I spent 2 months in Spain. During that time, I traveled to several different cities throughout the country. While brilliant memories were made in the more well-known cities like Madrid and Barcelona, some of my favorite, most personal moments were spent in the smaller cities, like Toledo. 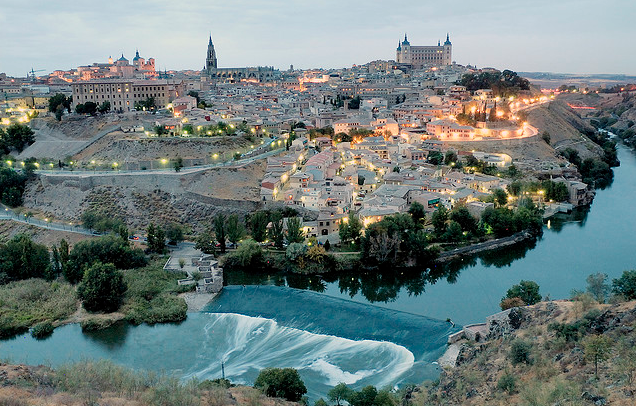 Before I traveled to Spain, I had never heard of the city of Toledo, yet when I traveled there, I felt such a connection to the quaint, classy city: the cobblestone streets, the brilliant abundance of black and gold art, the tiny yet touching El Greco museum, the beauty of the architecture. Every corner I turned made me happier and happier. It was like meeting a new friend and realizing you are actually long lost cousins. Toledo taught me that the world is huge. There is so much to discover. While our daily news channels may focus on the major cities of the world, there is so much more out there. It is so important to be open to new opportunities. Never underestimate what may be hiding around each corner. In your own neighborhood there may be a delicious new restaurant hiding behind an old, rusty sign or a charming antiques shop just beyond the dusty windowpanes. Always explore, keep an open mind, and never stop discovering. I like this post so much!!! Sounds like a very great time, isn't it? Toledo is also the name of our school network, which I have been trying to acces for an hour now and the server is still down! I love Toledo! And love your comments about always discovering. You never know what's around the corner! I unintentionally found your blog when I am doing some search for my upcoming EU Trip. I have to confess that I very much love your posts. They were written with so beautiful words. I enjoy reading and browsing a lot. Thank you. Keep it up!